The spring-driven, eight-day movement of this exceptionally beautiful carriage clock is constructed between plates. It consists of going and striking trains, as well as alarm. The going train has English lever escapement with hairspring balance and regulation. It can be adjusted by a regulator arm which can be seen through the window in the top and is accessible through the back door. 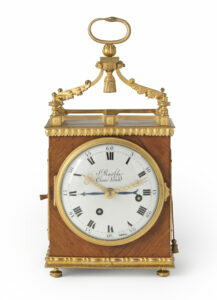 The striking indicates the hour fully and the half hours with a single stroke on a gong. 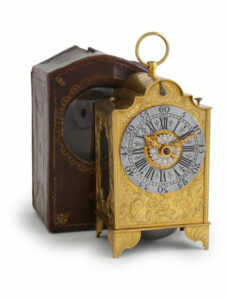 In addition, there is a repeat button on the front, with which the hour last struck can be repeated. The backplate is stamped with the retailer’s name: Ch. Grottendieck à Bruxelles. 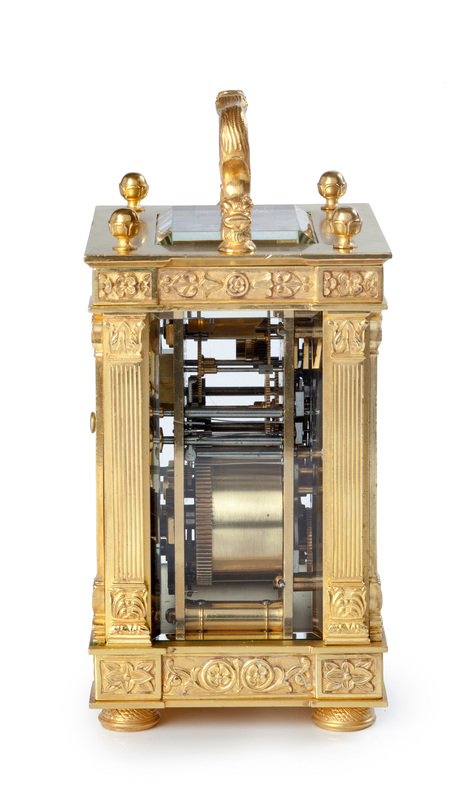 There is a strike/silent lever in the bottom plate (Sonnerie/Silence). 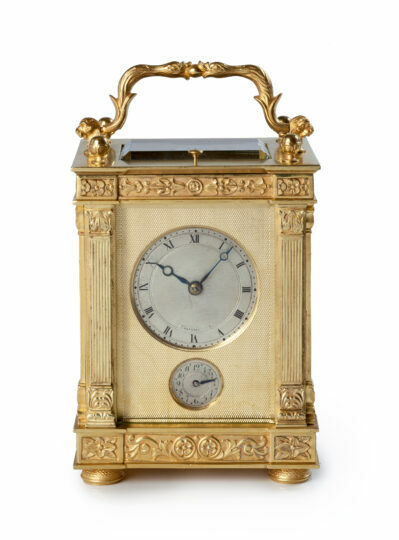 The clock is wound from the back and the function of the alarm and hands arbors is indicated in French, whilst the direction to turn them is clarified by an arched arrow. 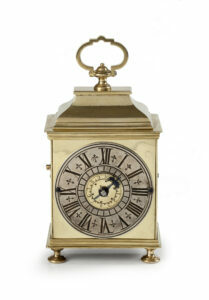 The silvered-brass dial is set in a gilt-brass mask and has a Roman chapter ring with five-minute and minute divisions. 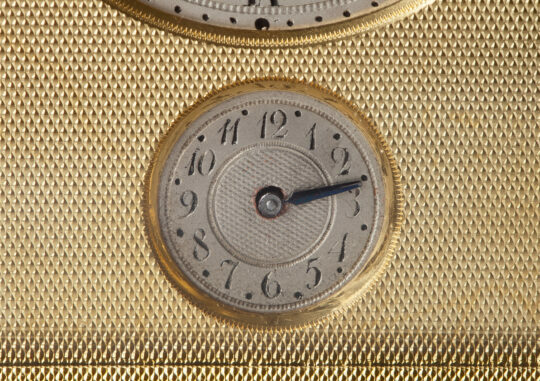 The time is indicated by a pair of blued-steel Breguet hands. 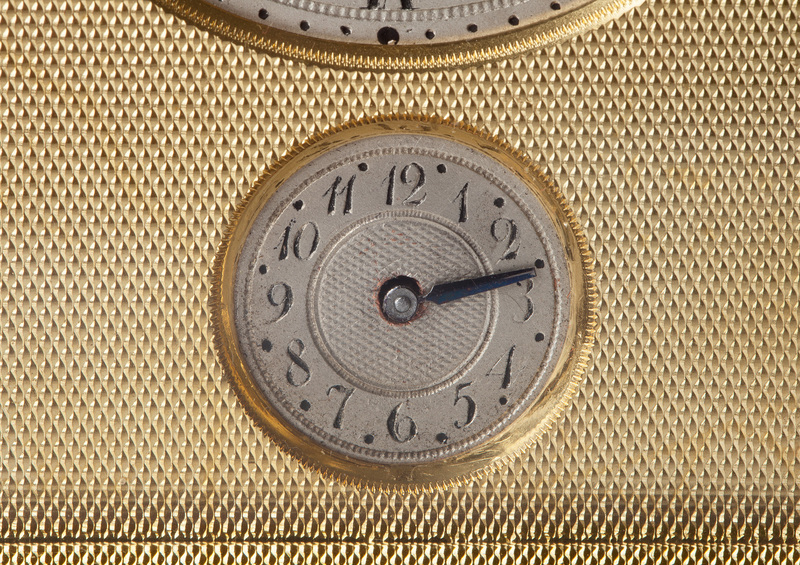 Below the dial is a subsidiary Arabic alarm dial, which is also silvered. The retailer has marked the dial with his surname: Grottendieck. The Empire-style gilt-brass case of this unusual and impressive carriage clock has facetted glass windows on all sides so that the movement is almost entirely visible. 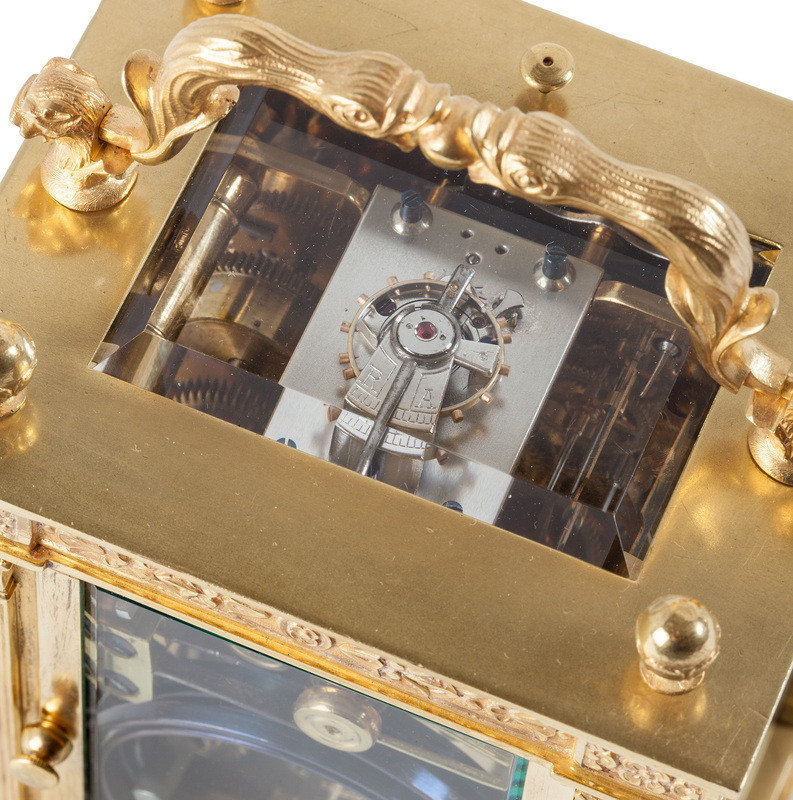 The silvered platform escapement can also be seen through an oval window in the top. The four fluted flat-profile corner pillars are Corinthian-capped. At the back is a door giving access to the winding arbors. 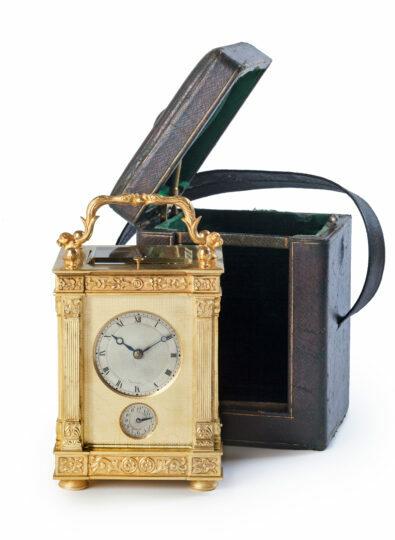 The clock is surmounted by four flower-bud shaped finials and a carrying handle in the shape of two opposing swan heads, hinged in two lion-head mounts. The case is embellished by rosettes and stamped: Ed. Chartier. Ed. 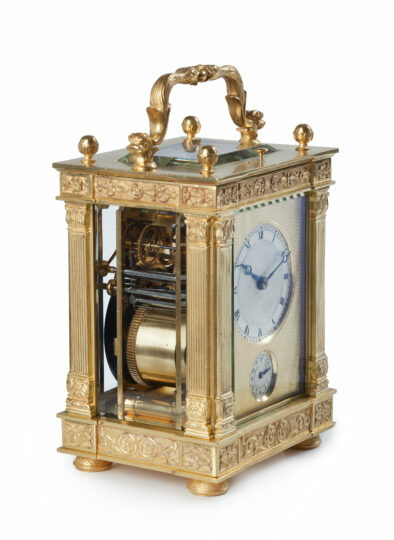 Chartier was a clockmaker, watchmaker and jeweller in Paris in about the period 1880-1900. Charles Grottendieck was a Belgian dealer and clockmaker in Brussels. 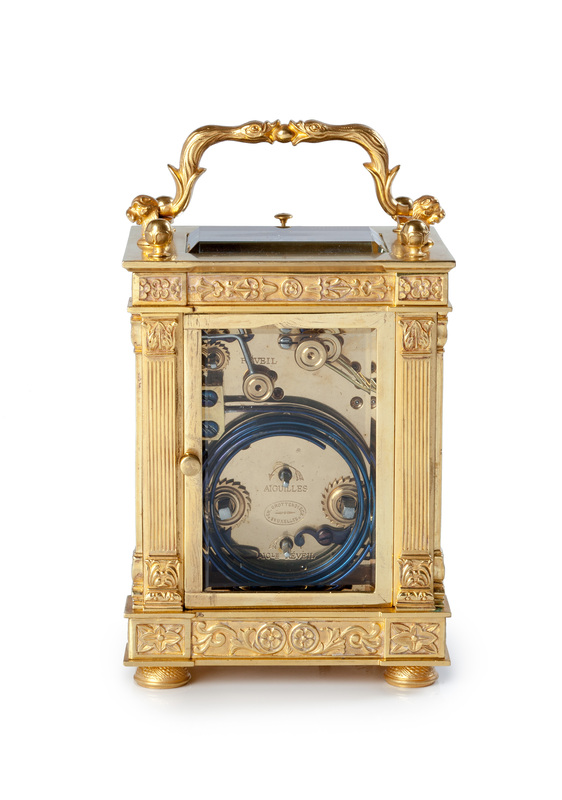 He was given the title ‘Clockmaker to the King and Queen’ in 1890.